A new multi-layered foam from FastCap called Kaizen Foam could be the end to your junk drawer. In my case, most of my drawers end up being junk drawers. To get a custom fit with Kaizen foam all you have to do is layout your tools, trace an outline around them, and cut the outline out of the foam. 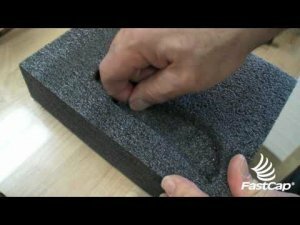 What makes the Kaizen Foam special is the way it is layered, which allows users to remove layers of foam based on the thickness of their tools in 1/8-inch increments. It appears to be pretty easy to cut all types of shapes into the foam, or you can even go to the next level and burn or melt more complex shapes. The Kaizen Foam is available in 20mm, 30mm, and 57mm thicknesses, in 2x4-foot sheets. You can get the foam in both blank and white, and the 57mm has a combo black & white option. Prices range from $9.99 to $19.99. Rockler.com has the Kaizen foam listed as coming March 31 2012. but this is a product Rockler should be selling in their stores aswell.